Here's the scenario. You have a 480V service where you establish your grounding electrode system at an external busbar . You also have a TMGB (Telecommunications Main Grounding Busbar) in your main telecom room which is bonded to the service ground busbar. From the service equipment, you are feeding a 480:208Y/120 transformer which has an established separately derived grounding electrode system and feeds a panel in the main telecom room which powers all the IT equipment. BICSI says you bond the TMGB to this panel's enclosure or equipment ground bus. Is this acceptable? Your equipment ground bus in the panel is derived from the separately derived system on the transformer secondary, but per BICSI you are also required to bond it to the TMGB which is part of the 480V grounding electrode system at the service. 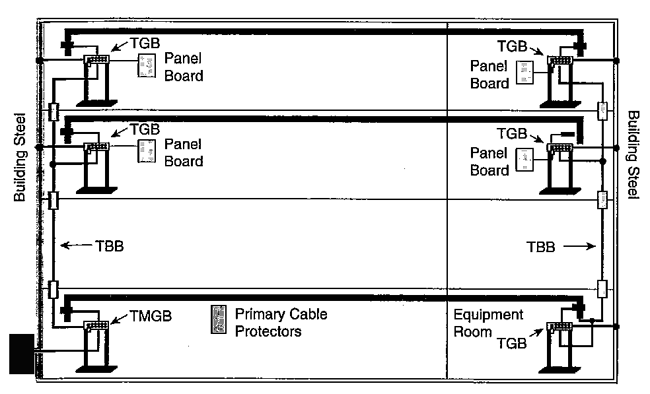 I guess in effect, the panel in the telecommunications room is bonded to two grounding systems which seems funky. I suppose the neutral current will return back to the separately derived system at the transformer, but any ground fault will split between the two systems. Thoughts? Last edited by strap89; 04-16-19 at 05:48 PM. The ground fault current will return to the transformer that feeds it. Yes, some current may flow on another systems grounding conductors just because they all should eventually be tied to the common GES. They are parallel paths. To add to Tom's response: All current, whether normal neutral return or ground fault current wants to go back to its source's neutral and takes all paths to get there. So there is no issue bonding this panel's EGB to the TMGB?